This year may prove to be a pivotal one in U.S.-Japan relations, a time to take the temperature of the current bilateral relationship and to consider its future in a world that is increasingly Asia-centric. Washington and Tokyo are key participants in an unprecedented effort to broaden and deepen trade and investment among Pacific Rim countries that account for more than a third of the world’s gross domestic product. The United States is explicitly rebalancing its strategic orientation toward Asia, while Japan is debating its future role in collective security. And both countries face a rising challenge from China. How the American and Japanese people see these issues may go a long way toward framing the future relationship of these onetime adversaries and longtime allies. In a new report, Pew Research Center examines how the people of the U.S. and Japan see the other nation’s role in the world. Here are five facts to help understand this sometimes complex relationship. 1Americans and Japanese trust each other. Roughly two-thirds of Americans trust Japan either a great deal or a fair amount. And three-quarters of Japanese share a similar degree of trust toward the United States, though their intensity is somewhat less. There is a gender gap in how both publics see each other. More American men (76%) than women (59%) are trusting of Japan, just as Japanese men (82%) voice greater trust in the U.S. than do Japanese women (68%). 2Neither Americans nor Japanese trust China. Just 30% of Americans trust China a great deal or a fair amount. Only 7% of Japanese trust Beijing, and then only a fair amount. Moreover, a quarter of Americans and half of Japanese do not trust China at all. Young Americans, ages 18 to 29, are more likely by almost two-to-one to trust China than are older Americans, ages 65 and older. Democrats (39%) are more trusting of China than are Republicans (20%). One reason so few Americans trust China may be that only 37% view China as having a fair trade policy with the U.S.
3For Americans, China’s rise makes ties with Japan more important. The rise of China as a military and economic power is one of the principal motivating factors driving the U.S. strategic and economic rebalancing toward Asia, and it plays an important role in U.S.-Japan relations. Six-in-ten Americans voice the view that China’s rise makes relations between the U.S. and Japan more important. Just 6% say it makes ties less important, and 29% say it makes no difference. Men (67%) are more likely than women (54%) and Americans ages 65 and older (65%) more likely than those ages 18 to 29 (51%) to hold the view that the Japan relationship is now more important because of China. 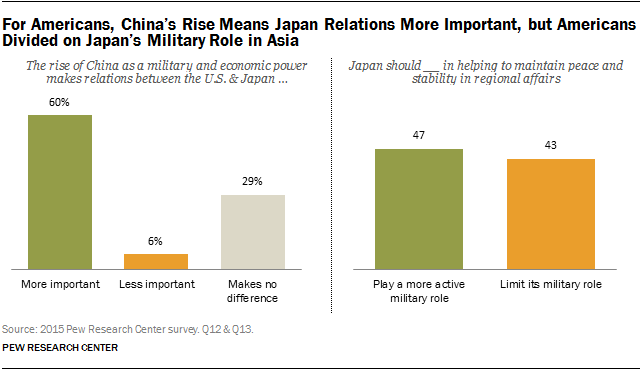 4But Americans and Japanese differ on Japan’s role in regional security. Seven decades after the end of World War II, the American public is divided over whether Japan should play a more active military role in helping to maintain peace and stability in the Asia-Pacific region: 47% would like to see Tokyo take a more active role and 43% would prefer that Japan limit its role. Americans who trust Japan also say they want Tokyo to play a greater strategic role in the region. 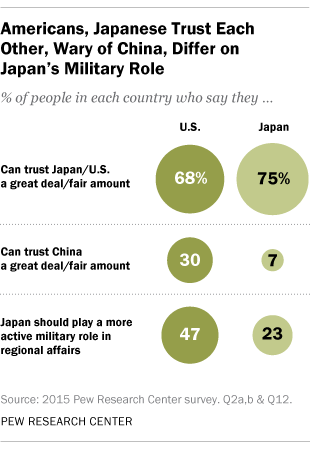 And Americans who do not trust China say they want Japan to take on more of the military burden in Asia. Among Japanese, there is little desire for their country to play a greater role in the region’s security. About two-thirds (68%) want Japan to limit its military activity. Only 23% want the country to play a more active role. 5Japan’s prime minister is unknown in the U.S. When Prime Minister Shinzo Abe visits the United States the week of April 26, he will be the first Japanese leader to address a joint session of Congress. He will meet with President Obama and be the guest of honor at a state dinner at the White House. Yet despite having served nearly three-and-a-half years as prime minister – since late 2012, and previously in 2006-2007 – he may first need an introduction to the American people. Only 11% have a favorable view of Abe. And this could largely be attributed to this fact: 73% say they have never heard of him.